Some of the most popular brews made by AleSmith Brewing Company. The world of craft beer is vast but San Diego’s AleSmith Brewing Company has carved out a name for itself as one of the best brewers in the world, according to a respected beer-ranking website. 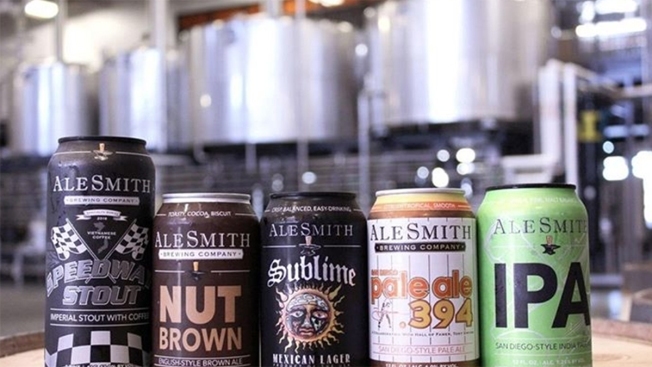 AleSmith – founded in San Diego in 1995 – was ranked No. 6 on the list. According to the website, the list was compiled based off a “summary score” on available reviews. That score is based on a combination of five things: reviews of the past year; top-performing beers; historical all-around performance; a brewer’s range of performance across styles; factors to compare newer and older, larger and smaller brewers under a single method of processing. RateBeer said the brewers in the top 100 rankings reflect the crème de la crème of more than 36,000 brewers listed on the website. The website’s founder, Joe Tucker and Portland-based beer enthusiast Ezra Johnson-Greenough announced the awards from the River Pig Saloon in Portland this past Monday via social media. Tucker said the brewers on the list were thoroughly reviewed, with dedicated judges spending “about 10 minutes per beer” when considering the best in the brewery business. AleSmith is certainly in good company. The list also recognized these San Diego favorites: Escondido-based Stone Brewing (No. 22), Modern Times (No. 23), Alpine Beer Company (No. 45), Ballast Point Brewing Company (No. 61) and Mikkeller San Diego (No. 65). To see RateBeer’s full top 100 list, click here. Now, AleSmith is no stranger to these honors. RateMyBeer ranked AleSmith the 4th best brewery in the world in 2017. In 2016, the company snagged the No. 2 ranking on the same list. Among craft beer aficionados, AleSmith is known for brews like its Speedway Stout, Old Numbskull American Barleywine and San Diego Pale Ale .394, a nod to late Padres legend Tony Gwynn. AleSmith’s beers are currently distributed in 28 states across the nation and eight countries around the globe, according to the company. The brewery, owned by Peter Zien, operates a nearly 110,000-square-foot facility and tasting room at 9990 AleSmith Court in Miramar, a community known as one of San Diego’s hubs for craft beer. The tasting room is open daily, from 11 a.m. to 10 p.m. Monday through Thursday, 11 a.m. to 11 p.m. Friday and Saturday, and 11 a.m. to 9 p.m. Sunday. In addition to his passion for beer, Zien recently launched an artisan cheese production venture dubbed CheeseSmith within the brewery’s Miramar facility.